Based near Cambridge, England, Arcam has been on this planet for about the same amount of time as I have, yet while I get greyer, grumpier and more decrepit as time goes on, it seems Arcam products become better sounding, more handsome and more efficient. The current FMJ series of amplifiers are a case in point with their striking acoustically damped metal casework, contemporary aluminium fascia and ergonomically pleasing volume controls. Even more interesting is the addition of Arcam’s Class G technology, which we’ll attend to shortly. 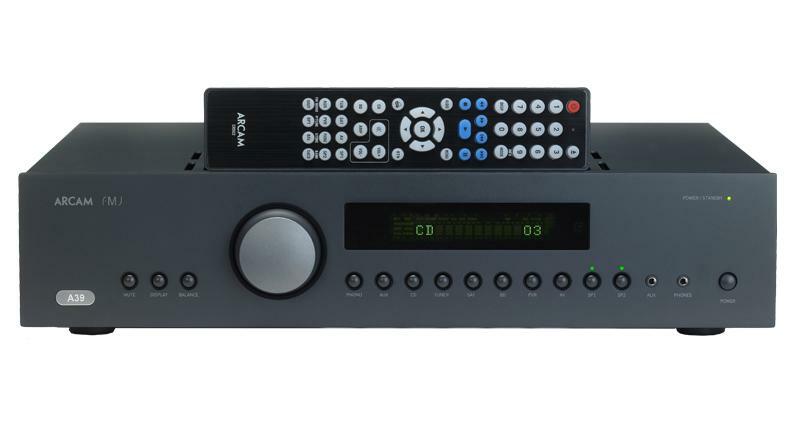 I owned an Arcam DIVA A65+ for a wee while and although admittedly it wasn’t amazing, at least not by my current standards, it had a lovely refined sound with pretty good levels of detail. If nothing else, it served its purpose for the duration of our time together by just getting on with playing all kinds of music. I do remember often wishing for a little more vigour and rather a lot more bottom end, but it wasn’t a bad little fellow. Good enough in fact that despite several years passing between parting company and the present, I was excited at the prospect of listening to some amplifiers from Arcam’s current range. 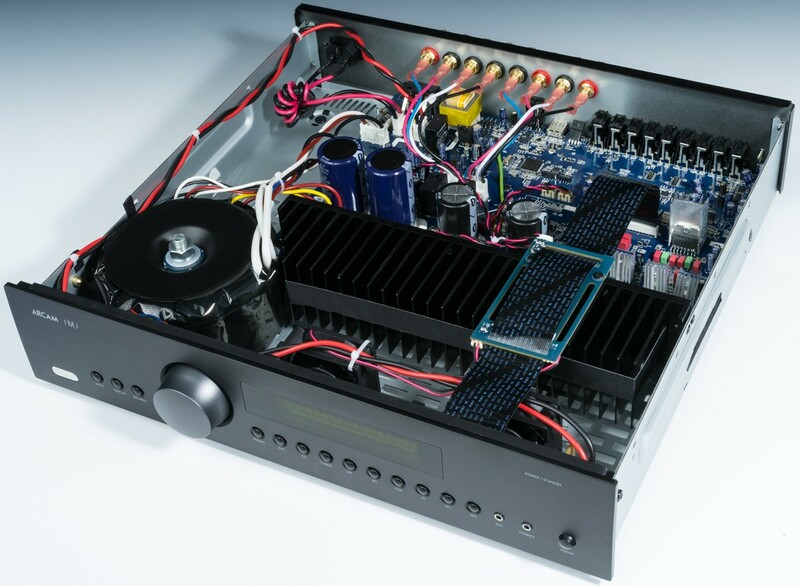 Thus, with thanks to Mark Kruck of SoundGroup distributors here in New Zealand, under review is the FMJ A39, a fine looking solid-state integrated amplifier which sits between the entry level A29 and the higher end A49 – which, priced at around ten big ones, is a fair way off from its smaller siblings. Putting out a very respectable 120W into 8 ohms or 240W into 4 ohms, the A39 is quite a large beast (433 x 425 x 100mm w x d x h) where my old A65+ and the FMJ A29 (which is also in for review) are relatively small. It has a generous 8 inputs, including a moving magnet phono stage with a 47k ohm impedance, which can be ‘turned off’ to be used as a normal line-level input if you want to use an outboard phono stage. The inputs are selected using the push buttons on the front and are correspondingly shown on an LCD display panel in green lighting. There are also buttons for muting the volume, dimming the display and adjusting balance and, as there are two pairs of speaker terminals, speaker selection. You’ll also find a 3.5mm auxiliary line-in plug for personal devices, 3.5mm headphone jack (with a load range of 16 ohms to 2K ohms) and the power on/off button. Around the back can be found a type A USB input which is used to power 5V accessories, inputs for recording and preamplifier outputs for those wanting to use a power amp. Feeling great in the hand, the solid aluminium volume controller is one of those incremental jobs where it is virtually impossible to suddenly turn the sound up terrifyingly loud – which is great if there are inquisitive toddlers (or adults for that matter) around. I did notice it seemed to rub on the chassis somehow when turning it by hand, but this was a demo unit which often tends to explain things like that. There is no built-in DAC which is of course quite understandable, as Arcam make some very nice standalone DACs and streamers of their own. Speaking of which, the A39 contains a separate power supply unit for powering Arcam’s ‘rSeries’ audio accessories. A slim plastic remote is supplied and can be used to control all functions available on the front panel as well as doubling as a controller for Arcam CD players, should you aspire to owning a matched setup. This is a very handsome amplifier indeed, beautifully made and great to look at in a modern, minimalist kind of way. Put your hand on top, even after it has been running for hours and you may feel no more than a hint, a ghost, a notion of warmth, and this is more than probably down to the Class G technology. Simply put, Class G amplifiers use more than one power supply to spread out the load, creating more efficient operation, greater transparency and less heat. So, the first power supply is of lower power, running in pure Class A (providing 20W per channel in the A39s case) and when the load increases, the secondary power supply gradually kicks in as required. Therefore, power is only used when needed and not wasted in the form of heat. In theory then, the precious and expensive power the amp is pulling from your wall socket is going into driving your speakers and not being lost into the air. Arcam asserts that this process ensures the amplifier keeps a tight grip on the loudspeakers along with delivering low levels of distortion and noise. Following a bit of a run-in period for argument’s sake, I began listening to some of my favourite music through the A39, using Reference 3A floor-standing speakers, my MHDT Labs Stockholm DAC and custom Lenco/EMT/A23/Analog Instruments vinyl playing rig. My Fi ‘Yph’ valve phonostage was also in use and if I may I’d like to use this opportunity to briefly pay tribute to Don Garber, the man behind Fi electronics, who sadly died on June 4 aged 81. Don designed and built unique and innovative valve amplifiers and although I didn’t know him personally, I was in communication with him briefly last year and he came across as a true gentleman. He also obviously had a good sense of humour: the “Yph” is pronounced “if”, which is of course Fi backwards. In no time at all the Arcam was impressing me with a wide and deep presentation, good detail retrieval and articulate and well controlled bass. Listening to Ricky Lee Jones’ magnificent album Traffic From Paradise (CD to FLAC rip) I noted the quiet noise floor which helped bring a clean, crisp presentation full of lush layers of sound which extended from well behind the speakers out into the room. The musicians were spread out front and back and on each side, displaying good scale and imaging. Low-level details, such as fingers sliding on guitar strings, creaks and thumps, decaying notes, or the sound of saliva in the mouth (Yum! – Ed) were given a subtle boost by the A39, and although not overly revealing, this lent musicians and their instruments a nice level of presence and character in what seemed a realistic setting. Tones and timbres were nicely replicated, rich and appealing and there was a good overall sense of balance and ease with the way in which music was conveyed. Bass didn’t go super low but it wasn’t loose or shabby, succeeding in keeping rhythms driving along. I don’t know if all the musicians were present at the same time during the recording, but the A39 did its job in making me believe this to be the case in the way everything fitted together. Jones stole the show with that expressive voice of hers and I noticed she sounded particularly, but naturally, nasal. I’m not sure how to categorise Horse Lords’ ‘Toward The Omega Point’ from the Interventions album (16/44 FLAC download). This young, arty instrumental band (‘avant-garde’, according to Google) has a very precise, almost mathematical approach to their sound which is based around percussion, bass, guitar and saxophone in a unique and interesting way. With unusual timing and strange instrument tunings and featuring syncopated rhythms and intoxicating polyrhythmic minimal Krautrock grooves, it could be a new direction for the tired old rock genre. I may be an old sod but some of the music the young folks are coming up with these days gets me quite excited. What could be dismissed as being repetitive guitar nerdery is revealed to in fact be something quite beautiful and hypnotic when given proper attention. This record rewards with fluid ever-evolving interlaced patterns of experimental sound which, when accentuated by sudden or sometimes subtle tempo changes and dynamic shifts helps create a captivating aural kaleidoscope. For the most part, the A39 was enthusiastic in its delivery. Interventions is by no means an ‘audiophile recording’ but the sound was spread out to the far left and right of the listening room, with a good sharp image floating in the front and plenty of depth to the rear. I was treated to a big solid sound with decent tonal balance and most importantly, the groove and soul of the music was related through the speakers. I would have liked a bit more bottom end impact on this track, especially from the drums, where the A39 gave the slightest hint of reticence, but I couldn’t help feeling more than a little compensated by the sweetly textured and layered midrange. Besides, its good wholehearted nature helped keep the music involving, and I was easily transported into the intensely constructed world of the Horse Lords. The on-board phono stage is a worthwhile input which should get your vinyl sounding sweet and impressive. Not merely an afterthought, it has a notably quiet noise floor and with a good cartridge should pull out plenty of detail and dynamic excitement. It worked nicely with my EMT cartridge and A23 SUT combination, providing a big, wide and engaging sound. Can’s Future Days was rhythmic, dense and gripping with Jaki Liebezeit’s intricate drumming style reproduced in fine form. The sound was nicely balanced, lush and groovy, with plenty of air and sense of space. The bass was solid with good thrust in the upper registers but didn’t overwhelm the more delicate and melodic guitar and keyboards or Damo Suzuki’s musing ethereal vocals. Likewise, ‘J’Ehin J’Ehin’ from Fela Kuti’s Fela’s London Scene LP had a good funky jazz groove, and when the horns kicked in they just refrained from the point of stridency, sounding bold and colourful. Fela’s shouting, imploring, call and response style vocals hung solidly over the music, as he clearly appeared to revel in the Afro-beats surrounding him. Despite the complex sound and no matter how complex things got, the Arcam had no trouble delivering the track in an organised, well-balanced manner. The more serious vinyl enthusiast/audiophile will most likely want a better outboard phono stage so that they may achieve greater levels of transparency and attack. But for the beginner or casual vinyl spinner, the Arcam is very capable when matched with a good cartridge, and if nothing else it serves as a good entry point. Since my last review where I wondered why New Zealand folky-singer Aldous Harding wasn’t more of a household name, it seems she is now steadily en-route to becoming just that. This is possibly thanks in part to an out-there performance on The Jools Holland Show which freaked out a few squares, a surprising music video for the single ‘Blend’ and a certain goat video ‘review’. But most of all it is Harding’s new album Party which is bringing her the attention I reckon she deserves, with rave reviews internationally and locally. I for one can’t wait to see where she goes from here and on into the future. Through the A39, the songs on Party (Flying Nun, vinyl) sounded rich and dramatic with a nice touch of warmth accentuating the album’s shadowy tone. Almost contrary to the folk label the first track ‘Blend’ comes on with an almost poppy groove, albeit with that signature hint of darkness, which the A39 delivered with infectious enthusiasm and poise. As always there was a good level of depth, perception and scale along with good textural detail retrieval. Harding’s vocal style changes throughout the course of the album and the A39 invariably pinned her down nicely, bringing out the differing tones and subtle shadings of her voice while also highlighting her expressive range, serving to underscore her sibylline lyrics. She was positioned dead centre, forthright and to scale, and the accompanying instruments were portrayed with equal elegance and character. I always find ‘At Least That’s What You Said’ from Wilco’s 2004 album A Ghost Is Born a great track to test any system. When the bass, drums and guitar kick in hard and sudden after the sung part at the beginning, you get the sense that the song is on the verge of self-destructing with all the instruments seemingly trying to scramble through the chaos to outdo the other. On a good system, this is truly breath-taking – I always listen loud and though I like feeling the air being moved by the thudding bass, I usually break out in a sweat wondering if the neighbours are going to come around carrying cricket bats to hand out some good old Kiwi justice. As usual, the A39 imparted a nice big soundstage, projecting the whole image into the room. It deciphered the disorder quite nicely by ensuring each instrument could be perceived, though I did feel the piano got just a little lost in the proceedings, which is an important point because the track revolves around the contrast between piano and strangled electric guitar as they work around each other in a kind of dual. The bass had good body and definition, though again – and here I’m being ultra-picky – I felt it didn’t quite seem able to keep up, lagging just off pace. Overall, the track was very enjoyable with excellent presence and scale, it’s just in terms of timing and lower frequency expression where I actually felt the Arcam A29 (which you can read about in my next review) did a slightly better job. The strengths of the A39 lie in its big bold presentation and its ability to draw the listener in without causing fatigue or boredom. Some styles of music clearly fared better than others and the quality of source material was also a factor in its overall performance, but it showed enough character and enthusiasm, even on lesser quality recordings, that I thoroughly enjoyed my time with it. A couple of very minor quibbles aside, the A39 is every bit a fine amplifier, and worthy of your consideration. Taking care with system matching should help you get the most out of it, but I think it should slot into many existing systems with little fuss, possibly depending on your music tastes and the quality of your recordings. You get a very nicely built piece of equipment with plenty of inputs, plenty of power to drive a good range of speakers and a room full of very pleasing sound for a surprisingly small sum of cash. Most importantly, the A39 helps to create a feeling of pure engagement with music. I can’t help but be impressed with the Class G power supply technology. There is no doubt it contributes to the A39’s sonic character and ability, and I hope to see it become more commonly implemented. As elegant to listen to as it is to look at and with the bonus of consuming less power than your average home amplifier, I can’t help but give the Arcam FMJ A39 a hearty recommendation. It is certainly floating around near the leaders in its class and will no doubt bring years of enjoyment to any music collection.